The nature of the library was forged in the Renaissance with the invention of printing and the explosion of information that followed, but which of us can say what the school library will look like with the information-retrieval revolutions of the future? 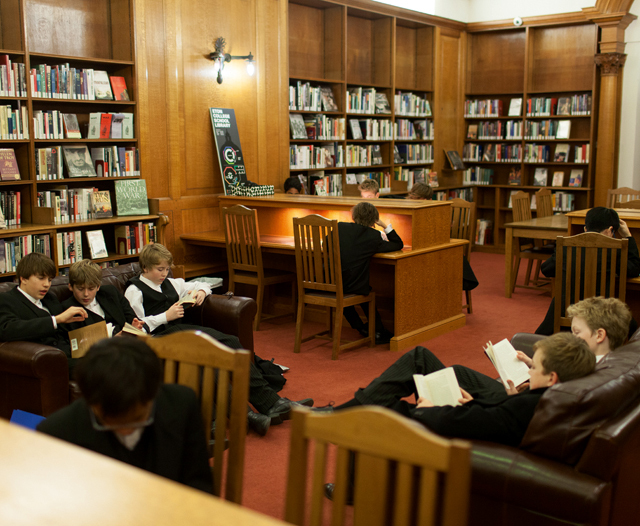 Most of the historic schools in the UK have very fine libraries indeed and many of them have also braved the task of making the spaces work for young people to work in and to engage with ideas and the history of ideas. The best school libraries today maintain an atmosphere capable of absorbing the exciting offerings of the digital world as well as the traditional book. To begin at the beginning: the very best of the surviving chained libraries that can still be found in a working school is the one at the Royal Grammar School in Guildford, Surrey, bequeathed to it by John Parkhurst, a 16th-century Bishop of Norwich, a native of the town. Eton’s library is popular with students for both study and relaxation. Credit: Joshua Tucker. Eton famously has multiple library collections of national importance, including the renowned College Library, as well as many notable buildings, but the main School Library, containing books and CDs as well as an up-to-date network of computers, is housed in a memorable late-Edwardian building, opposite the chapel, designed by L. K. Hall (an Old Etonian) and completed in 1905–8, as a memorial to Old Etonians who had died in the Boer War. It contains some 40,000 books. The main school library (as distinct from the renowned Fellows’ Library), is housed in a historic 14th-century brew house, which retains its medieval form externally, but was converted internally into the Moberly Library by architect Sir Herbert Baker in 1922. The library includes a computer room, a dedicated fiction library and a newspaper and journals area with com- fortable sofas. There was a major review of the holdings of the library in 2004, when its catalogue was updated and digitised. For the real ‘collegiate’-style library, we have Harrow’s Vaughan Library, which is handsomely housed in a Gothic Revival building designed for the purpose by the great George Gilbert Scott. It was completed in 1863 and is named after a reforming headmaster and follower of Mathew Arnold. The library, which underwent a major refurbishment in 2000, includes more than 33,000 books. In aristocratic style, the principal school library at Westminster School can be found in a suite of first-floor rooms in stately, late-17th-century Ashburnham House. This was originally the London house of the Earls of Ashburnham and designed by John Webb after the Restoration, in the shadow of the abbey. The main library contains some 22,000 books. For sheer atmosphere, few school libraries can beat the Memorial Library built in 1921 to commemorate those pupils and staff who died in the First World War. It was designed by Ernest Gimson and is one of the finest Arts-and- Crafts buildings in the country and has furniture made by Gimson and his associates the Barnsleys. It’s a memorable place to study or perhaps read the writings of William Morris. The library at Stowe is an unforgettable room, right in the centre of historic Stowe House mansion: indeed, this was the Duke of Buckingham’s library. It has its original bookcases on two levels and an ornate decorated ceiling restored by the Stowe House Preservation Trust in 2009–10. The restoration also included new bespoke furniture and new lighting. Where better to read up about the architects who worked on this great house and park? Oundle School’s Cripps Library has a light and spacious interior, with deep leather chairs set beside a feature oriel window. It’s recently been completely refurbished under the direction of Luke Hughes and Company, which designed and supplied the bespoke oak and leather furnishings and fittings. In addition to the double-height main room for 22,000 books, there is a reading room with displays of Ancient Greek pots and archaeology, a classroom with computer projection and a small room for the rare-book collection housed in sycamore cabinets. 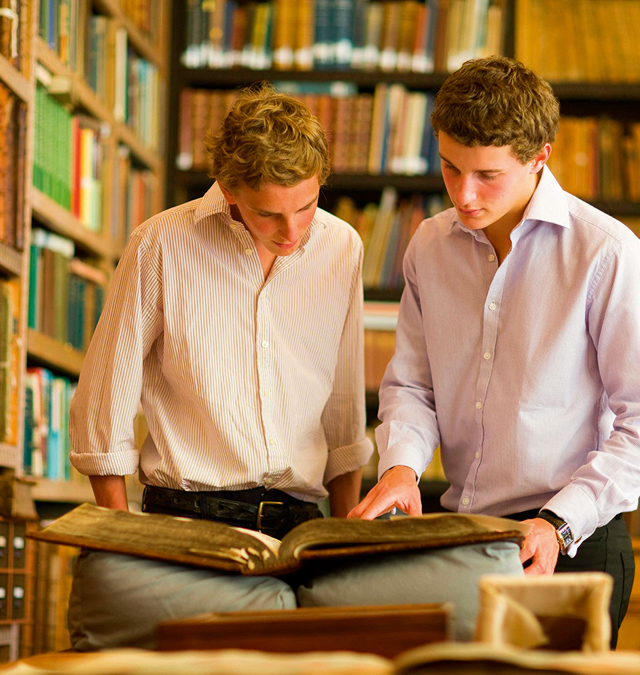 Shrewsbury School’s collection dates back to the 16th century. Shrewsbury School, Darwin’s alma mater, has one of the most famous historic library collections in England, dating back to the 16th century, but the main pupils’ working library is the Moser Library, containing some 30,000 books. This was purpose-built in 1916 and named in honour of former Housemaster Edward Moser, whose watercolour collection is housed in an adjoining gallery. Designed to impart a sense of convent-like seriousness to the girls of Cheltenham Ladies’ College in the 1890s, this Gothic collegiate-style library has, nonetheless, recently been fully modernised and—containing some 23,000 books—is clearly still cherished as a key feature of the life of the modern school. The 310ft-long marble corridor of the Library Wing is memorable in itself. A leading Roman Catholic school, Stonyhurst is well-known for its historic library and archives collections, but the school has also invested in a modern library environment within its historic structure: refurbished in 2004, the More Library has a dramatic, light-filled and galleried interior and is found on the first floor of the main South Front.